Don’t be afraid to stick to your ideals. 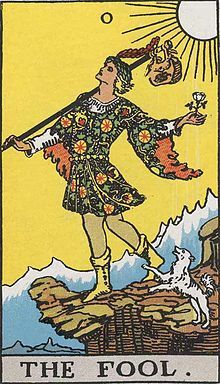 Traditionally, The Fool is the card of infinite potential and new beginnings — and maybe this is that kind of a day for you. For those of us who woke up to a world covered in snow, everything does seem fresh and new today. It’s a good day to not only start over (and you’re still in the “zone” for a new year’s resolution if you haven’t made one yet! ), but also to go out on a limb and take a risk. But to me, this card isn’t just about starting a new journey, but about approaching each step of the journey that you are already on with a beginner’s mind. The Fool isn’t just stepping out onto his (or her) doorstep — he (or she) has already climbed quite a distance into the mountains. And mountains, to me, have lofty ideals written all over them. Believe in yourself. Trust in the Universe. You are here with your dreams and ideals for a reason. The events around you are happening for a reason. Open up to that reason (or reasons) and new possibilities, new opportunities, new directions in which to travel will appear all around you. It might even be the case that the direction your dream takes you is straight off a cliff (metaphorically speaking — please don’t step off any literal cliffs based on my advice!). Simply not knowing the future makes many of us fearful — it makes us feel as though we are stepping off a cliff. But the fact is that you never know the future. All the directions that you think are such sure things by comparison with your dream are equally as risky and equally as unknown — you just don’t realize that yet. One more thing I’d like to say about this card is that if you go into life in a spirit of innocence and naivete, such a spirit carries with it a powerful amount of protection. It is not only angels who watch over fools — humans do too. If you are a cynic, you probably expect humans to take advantage of fools, but I have not found that to be the case. What I have found is that if you approach a situation trustingly, idealistically, with faith in the goodness of those around you, even those with evil intentions toward you will frequently find themselves dropping those intentions — and they themselves don’t even know why. People respond to elemental goodness and innocence even if they don’t even recognize within themselves that they are doing so. And those who once had evil intentions toward you will often end up doing you some good turn instead and sending you off with some paternalistic warning to take better care of yourself and watch out in the future. It’s as if trust in basic goodness were some kind of Jedi mind trick! You’ll think this is crazy if you haven’t experienced it yourself, but if you have, then you know it works. Previous Card for the Day: Justice Reversed!